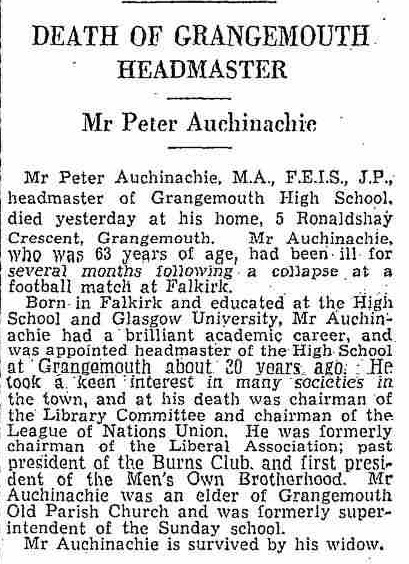 Another chap who was better known locally for his place in the upper echelons of civic society than for his youthful exploits on the football field, was Peter Auchinachie, for many a year Rector of Grangemouth High School and a Justice of the Peace to boot. Although born in Banff, Peter's family moved first to the Glen Village then to Falkirk when he was but a lad, and it was at Falkirk High School that his twin loves of education and football were kindled. But in 1893 his services were to be temporarily lost to local clubs as he went up to Glasgow University to undertake his masters [I believe it was in economics but I am not sure]. At the same time he qualified 4th in his class at the CoS Training College [the institution that became Jordanhill College]. In a later commemoration of him it was stated that he played for the University's football club during his time but I have found no evidence of this from the time. The first time I have found him relating to football is from Falkirk Amateur's first ever match a 4-2 defeat at the hands of Camelon's 2nd XI right at the tail-end of the 1896/97 season. And although I have never found anything to tie down the formation of Falkirk Ams it is not too far to surmise that most, if not all, of the players in that match were among the founders of the club. Although he was a stalwart of Falkirk Amateurs for it's first two full seasons, his appointment as Assistant Headmaster of Grangemouth High effectively ended his playing days. During this time he managed to play the one match for Falkirk FC [he played in the last Central Combination match of the 1897/98 season as Thomas Turnbull had made it clear that he was leaving for East Stirlingshire as soon as possible], yet his association with the town's professional club was not over, as Peter served on the committee between 1901 and 1904, as well as temporarily holding the post of treasurer in 1903 when Harry McNaught emigrated to the USA. 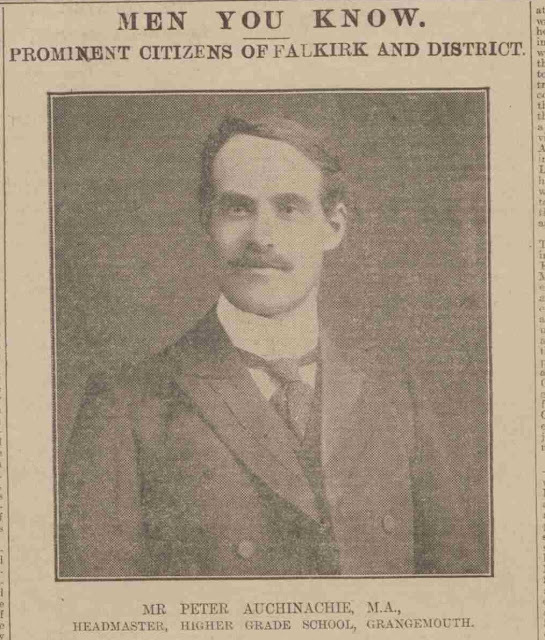 After this point though the only references to him are to do with his educational career, Falkirk FC in 1905 became a PLC, and there was no need for a committee, and certainly not a committee made up of gentlemanly amateurs with a love of the game, and his attentention seem to have shifted toward the Grangemouth Burns Club. Nota Bene - Falkirk Amateurs suffered from a lack of indepth reporting in its very early years so this only represents matches with team line-ups, he probably played in a good number more.